Recently the Google Analytics User Explorer Feature was released. It’s a great new way for digital marketers to better understand and analyze individual user behavior. Basically each row represents a user and their associated metrics. This way you can begin to filter, sort and segment in ways that identify the most interesting and/or engaged users. Once you’ve clicked into a row, you’ll see a report that details the individual user and attributes like acquisition date and channel in the left hand pane. Accross the top you’ll see summary metrics for the individual user. 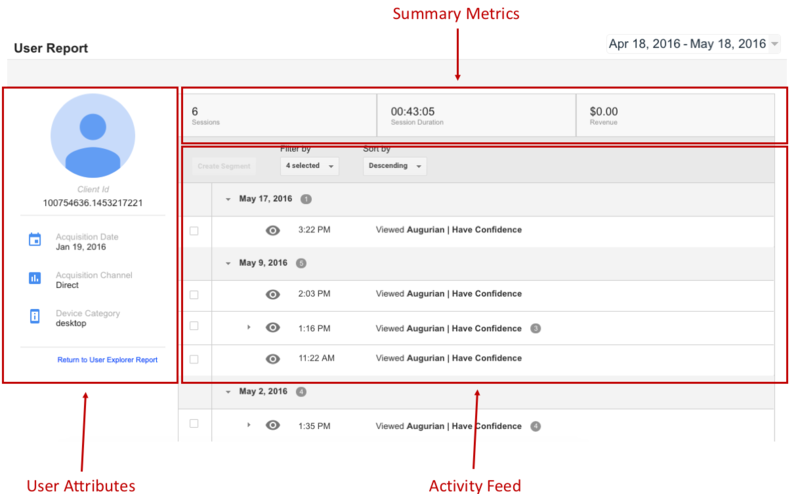 The Activity Feed allows you to examine per session behavior. Lastly you can filter the session information by things like Pageview, Goal, Ecommerce and Event dimensions and metrics. Here is how they announced the Google Analytics User Explorer Feature in the Google’s Analytics Release Notes from April 11, 2016. Let us know if you’d like to learn more! Happy analyzing!